La Roche-sur-Yon, Vendee | Tourist information on La Roche-sur-Yon. La Roche-sur-Yon is the Prefecture (capital) of the Vendee, it is the administrative centre for industry, tourism, the courts and all things political for the department of the Vendee. 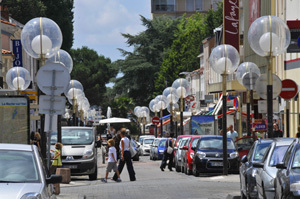 It is as central within the vendee as is possible and was planed as such. It was Napoleon who choose a small town which had been burnt down by the Republicans in the war of the Vendee to replace Fontenay le Comte as the prefecture on the 25th May 1804. He choose it to make a new city, a symbol of pacification, reconciliation and economic revival. The town was rebuilt from scratch by one of the empires top engineers and was planned by compass, giving the impression of a 'geometric Barracks'. Six great roads "of Pacification which were designed to allow the free movement of troops converged onto a pentagon surrounded by wide boulevards and crisscrossed at right angles by a grid work of streets, everything perfectly aligned in faultless symmetry finishing up at its centre with the parade ground, a large rectangular esplanade which today has the statue of Napoleon on his charger, erected in 1854 and plays host to many of the cultural events including the outdoor market on Tuesdays and Thursdays. 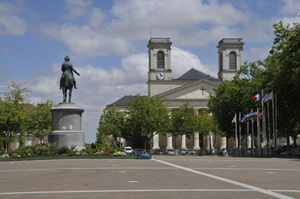 Napoleon arrived at Napoleon-sur-yon (as it was the called) in 1808 and sacked the engineer who had built a "mud Town" and ordered it rebuilt using proper soldier materials when completed it was renamed "Bourbon-Vendee, later to be changed again to Napoleon-Vendee during the second Empire and it was not until the third republic with military activity stopping that it reverted to its original name of La Roche sur Yon. The Haras de la Vendee is one of Frances largest stud farms. Situated in the centre of La Roche sur yon on 4.5 hectares. You will discover the worlds only academy for horses, there are equestrian shows with all aspects of horsemanship including dressage, but it is also very educational including saddlers, blacksmiths and a collection of the various breeds of horses of the world. 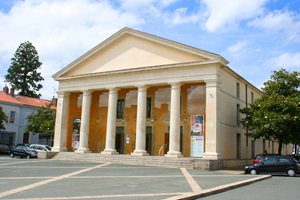 Le Theatre de La Roche-sur-Yon. Place du theatre. A hall for spectaculars has been functioning since 1812. In 1842 when the town was called Bourbon-Vendee it was decided to construct in place of the original barracks that had been constructed following the wars of the Vendee with a new theater. Built in stone from Lucon in Italian style with the main hall in the shape of a horseshoe. The interior was decorated by the painter Louis-Lucien Penne. The theater was completely renovated in 2004 and is a public monument worthy of a visit. Open 5th July to 28th August, Guided tours monday to Saturday 15h to 18h entre free. Maison Renaissance, Rue du Vieux-Marche. The maison Renaissance has opened its doors each year since 1995. The house was constructed in 1566 in the heart of the ancient town. On the ground floor is a exhibition dedicated to the evolution of urbabisation of the town from 1092 to the present day. On the first floor is an exhibition on the industrial vendee of Rene Couzinet a young engineer who in 1927 flow across the transatlantic L'arc-en-Ciel, the exhibition trases the destiny of this constructive genius. Open 5th July to 28th august mondays to Saturdays 15h to 18h. Entre is free. Gardens of Loriot. La Mancoliere, Venansault. Just 12kms from la Roche sur Yon on the road to Les Sables d'Olonne are the 5ha gardens of Loriot, a botanical gardens with 130 species of bamboo from Asia Africa and the Americas and over a 1000 species of flowers and plants from around the world. Entrance fee is €6. Open from 1st June to the end of August Wednesdays to Sundays and at weekends from April till September. Tel.02 51 46 73 52. Culture. La Roche -sur yon has many cultural venues and events to view them go to Culture la Roche-sur-Yon. Permenent exhibition of works by local born artist Paul Baudry(1828-86), Pioneer aircraft designer Rene Couzinet (1904-56). Artist designer Benjamin Rabier (1864-1939) who designed the laughing cow logo (vache-qui-rit).